Cuddly dog toys for babies are an easy to buy gift for family and friends to give to babies. Why? Because cuddly dog toys are soft, cute and you know they will look adorable in a baby’s nursery. Because they are soft, you know they are just the right texture for a newborn or very young baby. You don’t want to give hard plastic toys to very small babies, first of all because you know this is going to be a cold and hard texture for a baby to have. Soft, plush, cuddly toys are ideal because they are soft and won’t hurt the baby. 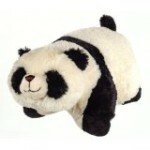 Animal plush toys are cute but cuddly dogs and cats tend to be a firm favorite with many parents and caregivers. Note: Many plush toys are not suitable for children under the age of 3 years. Therefore, if you are buying for small babies, you must check the label or the product description if you are buying online, to check whether the toy is suitable for young children.